The following is a guest post from my friend, Joe. He’s hip, cool and a world travler! If interested in submitting a guest post, please read our guest posting policy and then contact us. I have a bit of an unusual hobby while traveling. I like to find bridges and high places to go cliff jumping into the water below. There’s nothing quite like the thrill of leaping off a cliff, free falling through the air, the shock of hitting the cold water and plunging deep down into it, and finally coming up for air realizing you’re still in one piece. Sounds a little crazy and intense? Well, you’ve probably seen it done in movies and wondered what it felt like. If you’ve got some daredevil inside you and are itching to try it out but weren’t sure how to go about doing it safely, here are 8 tips to keep you out of harm’s way when seeking the thrill of jumping off cliffs. If there is a high dive at your local pool, I recommend climbing up that ladder, walking out to the edge of the diving board, peering over the edge and jumping feet first into the pool. Make sure you are able to jump in a controlled environment before attempting cliff jumping or anywhere outdoors where many other factors come into play that make it a lot more daunting. This may sound obvious but there have been many accidents as a result of cliff jumping and landing in water that was too shallow. The safest way is to pick a well known jumping location where other people have already jumped successfully in the past. Talk to the locals, tourist staff, and experts who have jumped there before to find out anything special you need to know about the water depth in that spot. It also wouldn’t hurt to swim under the area with some goggles to take a look yourself. Also remember that many factors may affect the depth of the water. For example, at La Quebrada, one of the most famous cliff jumps in Mexico where only professionals are allowed to jump, the dives can only be done at high tide and the diver must hit the water when the incoming wave is at its highest point. This is obviously an extreme instance but is an example nevertheless of factors that may affect your jump. Have some friends with goggles swim around the area where you will be cliff jumping to look for hidden rocks, branches and any other debris that could hurt you when you land. Make sure there are no tree limbs hanging out, wires or loose boards protruding or other hindrances that could snag you on the way down. Ideally you will have a clear path to gain momentum to jump outward from the cliff, clearing yourself of the cliff face and any other obstacles before landing in the water. Make sure there is a safe way to exit the water. When jumping into the ocean, be aware of riptides. Also be mindful of the waves crashing onto the cliff face which will make it extremely difficult and dangerous to exit the water. 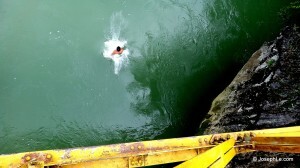 If cliff jumping into a river, be aware of the current. For example, at this particular jump (photo below) off of an abandoned railroad bridge located in Semuc Champey, Guatemala, the river underneath had a strong current. Once you landed, you had to start swimming immediately to shore. Even as a decent swimmer, I drifted downriver quite a ways before reaching the side. If you were already fatigued before jumping and then have a rough landing which disorients you, problems could occur trying to exit the river. Unless you’re a professional, don’t attempt to dive head first from a great height since there are too many things that can go wrong. If you over-rotate, you’ll end up landing on your back; under-rotate and you’ll belly flop. Both situations could be disastrous. When landing incorrectly you have a great chance of compressing your spine, breaking various bones, getting a concussion, or even getting paralyzed. The best method is to jump feet first, using the ‘pencil dive’ technique. Keep your feet pointing downward and your body as tight, compact and vertical as possible. This limits the point of contact when impacting with the water. Breathe out before impact to prevent water going up your nose. Contrary to popular belief, you are not cushioned by the water below. In fact, if you land wrong, it will feel like hitting a brick wall. Anyone who has landed roughly in water will tell you the same. Depending on the height from which you’re cliff jumping, you will reach speeds from 25 mph up to 45 mph when hitting the water. That’s why your technique is so important. 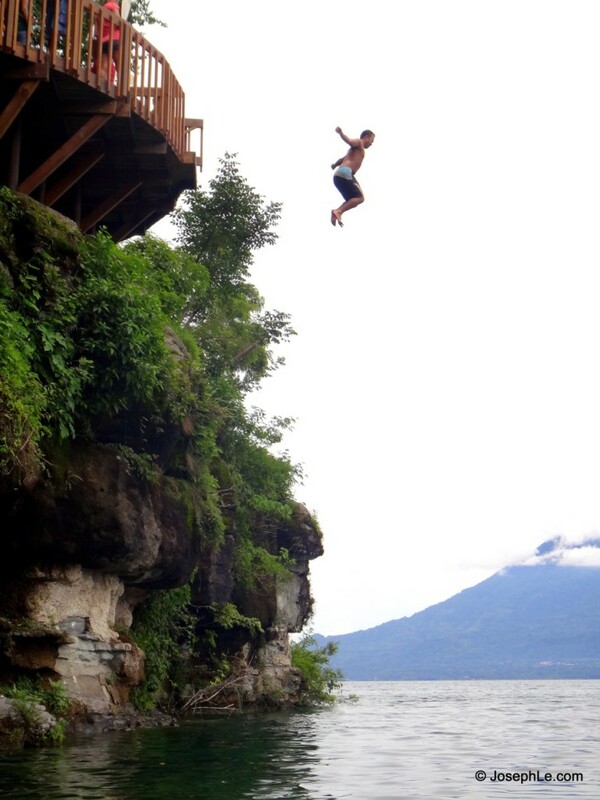 Cliff jumping tests both your physical and mental limits so be sure that you are properly prepared. 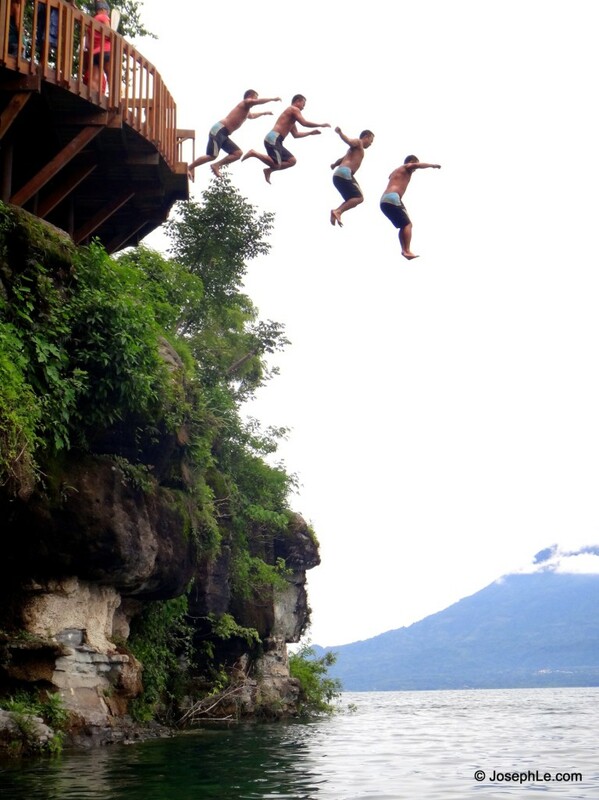 Never jump on a whim or because of a dare. Never pressure someone else into jumping who is not completely willing. Make sure your mind is clear and that you are in good physical condition. Do not drink alcohol before jumping because it will impair your abilities and your judgment. Visualize the jump and be confident in your abilities. If you are not, then don’t attempt the jump. The worst thing you can do is be less than enthusiastic about the jump and not execute properly because you are not focused. All the safety checks have been done and you’re ready to go. Have a friend standing by with a camera set to quick shutter or continuous shooting mode to capture the moment. Now jump and enjoy your free fall! *Legal disclaimer: Please be careful and do not get yourself hurt. Do not attempt cliff jumping if you are out of shape, have heart problems, have a fear of heights or have any other medical conditions that might jeopardize your health by doing this. Neither FearlessMen.com or JosephLe.com assume liability for injuries resulting from your attempt at jumping off a cliff or bridge. “I have a bit of an unusual hobby while traveling. I like to find bridges and high places to go cliff jumping into the water below. There’s nothing quite like the thrill of leaping off a cliff, free falling through the air, the shock of hitting the cold water and plunging deep down into it, and finally coming up for air realizing you’re still in one piece. Sounds a little crazy and intense?” I think it I were to try this my colon would end up coming out… I am way too big of a baby when it comes to heights. I’ll leave it to those who enjoy it. 🙂 Good post! Haha, awesome dude! I’ve never done something like this! Well, I’ve jumped off the highdive at pools, but nothing like what you’re talking about here. I did jump from a tall tree with a rope swing in my hand. The rope snapped and I really smacked into the ground. It felt like I broke everything in my body, but turns out, no broken bones. Did have a concussion though. Probably should’ve checked the rope before jumping…which gets back to your point, man. Check safety stuff first! Those rope swings can definitely be dangerous as well. Glad to hear that at least you didn’t suffer any broken bones. I’ve had a few rough landings and near misses myself. No photo credit there Joseph!? My apologies Meghan!! I wouldn’t have gotten such great shots without you posting up so patiently in the kayak! Let me contact the editors to make sure you are credited. 🙂 Btw, next time we go back, you’re jumping with me! This is sweet! If somebody is actually willing to verify the depth of the spot you’re jumping in at, and confirm that there isn’t anything underneath the water that could hurt you, then I think this would be a blast! The problem is that some people just jump and really don’t know what they’re jumping into. If you have a plan and follow these steps, I can see how you can make this a pretty safe hobby! Sounds thrilling! Thanks for your comment and I totally agree Jason. I urge anyone wanting to try this out to make sure they follow all the safety checks. We want people to have fun but not at the risk of hurting themselves in any way. One note that is skipped and which the pictures confuse: make sure your arms are down to your side. If you leave your arms up like wings, they will sting STING!!! I’ve even gotten bruises from a big jump when an arm was out. Otherwise awesome post and I love jumping – it’s one of the best thrills. That’s an excellent point to keep your arms tight against your body upon impact to avoid unnecessary bruising and pain. It’s difficult to see in the photos my position upon entering the water and so I’m glad you brought that up! I’m glad you enjoyed the post and thanks for stopping by! I just wanted to see if you were currently interested in additional guest bloggers for your blog site. I see that you’ve accepted some guest posters in the past – are there any specific guidelines you need me to follow while making submissions? If you’re open to submissions, whom would I need to send them to? I’m eager to send some contributions to your blog and think that I can cover some interesting topics. Hi Tess! Please write us through our contact page above. Thanks! In the comments I’ve read that it’s best to keep your arms down to your side when jumping from high heights. However, an instructor at a canyoning trip once told me that it’s best to have your arms crossed in front of your chest, as that would reduce the amount of water hitting your face. And as for the latter technique, wouldn’t the impact of the water hurt your elbows and lower arms? At 2:12, a boy which appears proffessional is strutting out his legs straight horizontally into the water while letting his arms out to his side. Is this better than the pencil dive or is he just prentending to be proffessional?